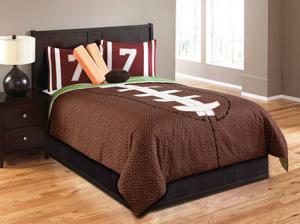 Shopping for bedding that has a sports theme is often the first choice for athletic or athletic-at-heart kids. Find gender specific, sports specific, and even multi-sport designs that can be incorporated easily into your child's bedroom décor. BeyondBedding, via Amazon, gives soccer a girl's touch with this 100% cotton and embroidered four-piece twin bed set by Sweet Jojo Designs. The pink and black bedding ensemble uses diamond shaped patchwork heavily outlined in black while alternative the shapes with light and medium pink colors. Applique soccer balls fill several diamonds. The sham features the large embroidered word "GOAL" and the window valances feature black trim with appliques of soccer balls and stars. Buying Pottery Barn Teen's 2015 NHL Patchwork quilt and sham is a great way to start a sports-themed bedroom design for your hockey fan. The quilt has appliques of the NHL logo of all the teams. This quilt has added value since it's reversible with a solid colored cotton percale backing. It features embroidered quilting for a finished look. The quilt is also bordered with a charcoal colored cotton twill that complements the blue, gray, red and gold colors in the patchwork design. The Home Decorating Company indulges the child baseball player and fan with a three-piece RizKidz Baseball quilt set by Rizzy Home. The quilt is made from 100% cotton fabric in navy blue, aqua and beige. Iconic graphic appliques of a baseball hat, baseball and bat are embroidered inside the patchwork squares offset by navy blue and aqua striped squares. Home and Patio Decor Center features the Touchdown 5-Pc Twin Football Comforter Set from Hallmart Collectibles. The ensemble centerpiece is a comforter that features an oversize football with white laces. The fabric resembles the embossed leather brown of a football. Hallmart Collectibles boasts an oversized comforter to accommodate pillow top mattresses. JCPenney sells the Sports and Stars Quilt Set in a twin size. It features six different sports (volleyball, basketball, baseball, bowling, soccer, and football) against a blue background. Stars in red and blue are amidst the sports balls. The set is machine washable. Overstock carries the Thumbprintz Basketball Sports Silhouettes Duvet Cover. It has an orange basketball made up of the silhouettes of players on a black duvet to create an eye-catching look in a bedroom. The cotton/polyester set is machine-washable. 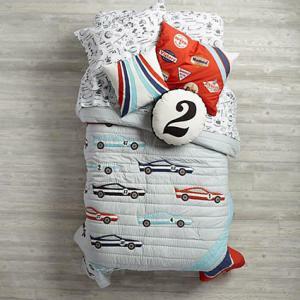 The Land of Nod Pit Crew Bedding is an exclusive design from Dustin Wallace and features racecars, racing stripes, trophies, and pit stop tools graphics in this juvenile bedding collection. The bedding is available in twin and full/queen as well as baby crib and toddler bedding sizes. The quilt and sham are reversible and embroidered with racing icons on one side and a solid color on the other side. A 200-thread count cotton percale sheet set is printed with all the racecar and pit shop graphics in gray against a white background. Three throw pillow styles are available in racing stripes, number 2, and number 9 patterns. Kids Bedding Dreams fulfills any skateboarder's dream with the Skater Quilt Cover Set. The hi-tech graphic design created in a grunge effect reveals a posed skateboarder and skateboard in neutrals with blue and orange. Constructed from "deluxe percale polyester cotton" this set is made for softness and durability. This is an ideal set for any skateboard enthusiast. 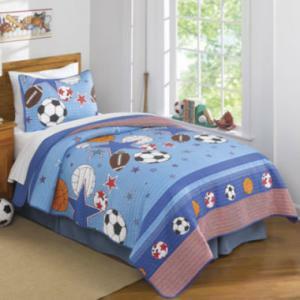 Sports-themed bedding is an excellent choice for the young sports fan and is a great way to show support and encourage continued interest. If your children's interests leads them to seek out sports bedding from volleyball to baseball, feel confident you can find the right style to complete the bedroom they desire.